Surprise! Welcome home, Meghan Markle. The Duchess of Sussex, who is expecting her and husband Prince Harry's first child and is in the third trimester of her pregnancy, secretly flew from London to New York her baby shower, which will be attended by her close friends in the U.S., E! News has confirmed. According to Harper's Bazaar and Page Six, the party will take place on Tuesday. The latter outlet said her BFF Jessica Mulroney is organizing the shower. This weekend, Meghan visited the Ladurée restaurant and bakery in Manhattan's SoHo neighborhood, a source confirmed to E! News. Us Weekly, which first reported the news of the duchess' visit, quoted an eyewitness as saying that the duchess ate lunch with a friend. A source told Harper's Bazaar that Meghan's visit was planned months ago, adding, "The trip is a lovely chance to catch up with friends and spend time in a city she loves. This will be the last time a lot of them will see Meg until after the baby is born so it's nice to share precious moments." "It's been a relaxing visit," another source told the outlet. "Nothing beats face time with your friends. Meg will be flying home refreshed and relaxed—and with a lot of new baby clothes." The Duke and Duchess of Sussex are expecting to welcome their first child this spring. No photos of Meghan's secret trip to New York were made public. Kensington Palace declined to comment on the visit. 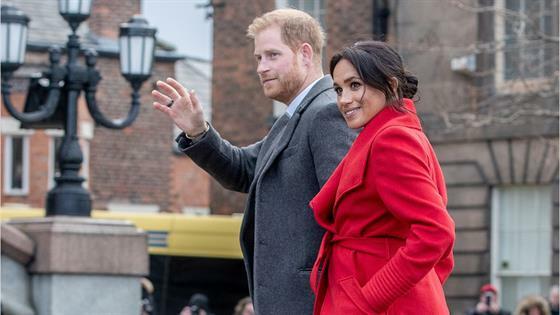 Meghan, a Los Angeles native, has made secret solo trips abroad before since her and Harry's royal wedding last May. In August, she flew on a commercial flight to visit Jessica and husband Ben Mulroney at their home in Toronto, the city where the duchess used to live and film Suits before she quit her acting career to concentrate on her royal duties. In 2017, months before he proposed to Meghan, Harry made a secret trip to Toronto see her.